Due to personal health reasons and family commitments, I have not been involving myself with anything pertaining to our local Malay entertainment scene since Pesta Perdana ended, in fact harking back to the end of the Ratu Suria competition. You can safely say that I have been switching myself off from the scene. I had initially planned to attend and post weekly photographs of the current TeRaSeh competition which is currently underway, but the fact is, I have not attended a single weekly episode since its inception some seven weeks ago, no thanks to my schedule and also my reservist, which was during Episodes Two and Three. However, thanks to Mediacorp Suria, I was brought out of my “hibernation” for a memorable trip to Kuala Lumpur recently. 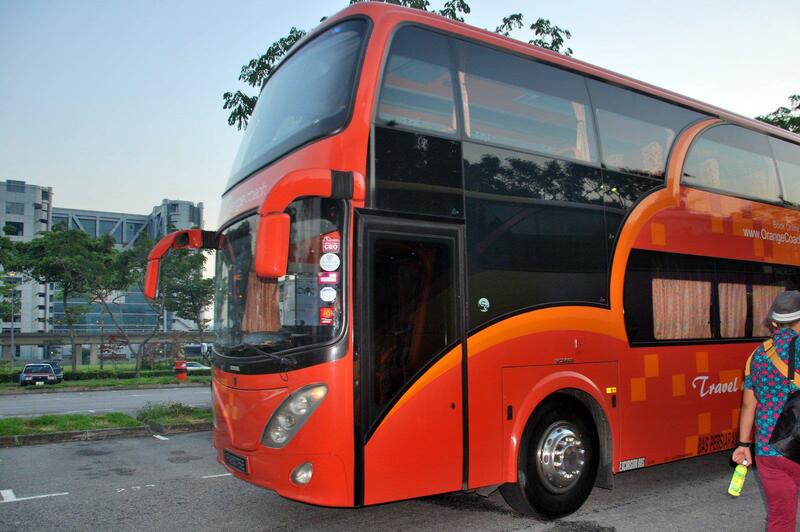 Our kind sponsors for the trip – Orange Coach & Travel Pte. 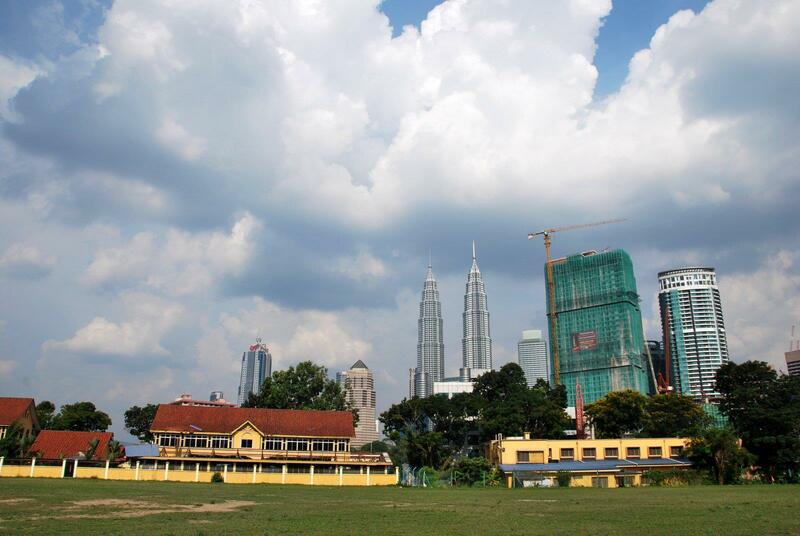 Ltd.
Close to four weekends ago, I was fortunate to be invited by Mediacorp Suria to be a part of the football team that took on Persatuan Seniman Malaysia at Kelab Sultan Sulaiman, which is situated in Kampung Baru, Kuala Lumpur. 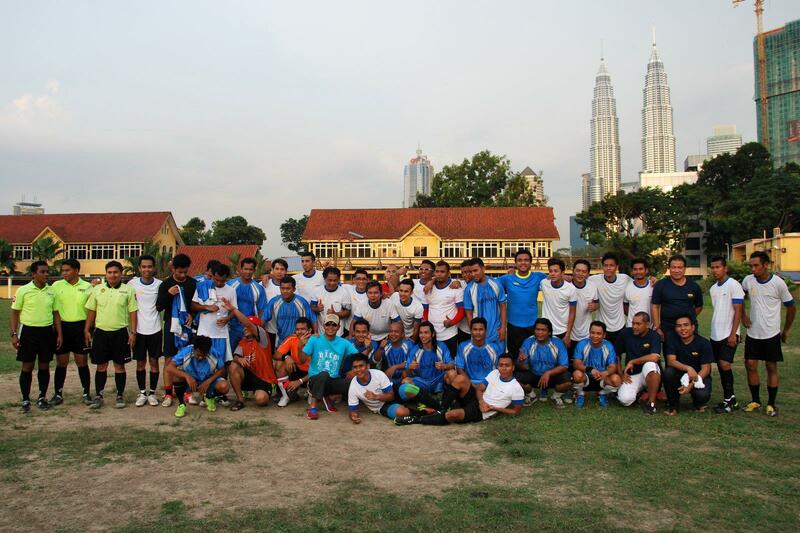 Similar to the last Piala Dollah Kassim tournament, the squad that travelled to Kuala Lumpur was more or less the same with Rafaat Hamzah again captaining the side and familiar faces like Shahril Wahid, Sahfuddin Mahfudz, Effandy Idris, Anugerah Skrin 2010 alumnus Md Idris Jamin, Aidil Jufri Jumari, Raja Razie, not forgetting the First XI players Alang, Mohd Helmi and Faliq Sudhir. This team also welcomed a few guest players namely Danial Ashriq, Izzat Yusoff, Hasyf Nasir, Hafiz Nasir, Noe Chicanoe (Opening Act Go Glam fame) and local singer Raja Izzuwin Shah, who also acted as the coordinator of this friendly match, along with his wife Lydia (Shootz 19). 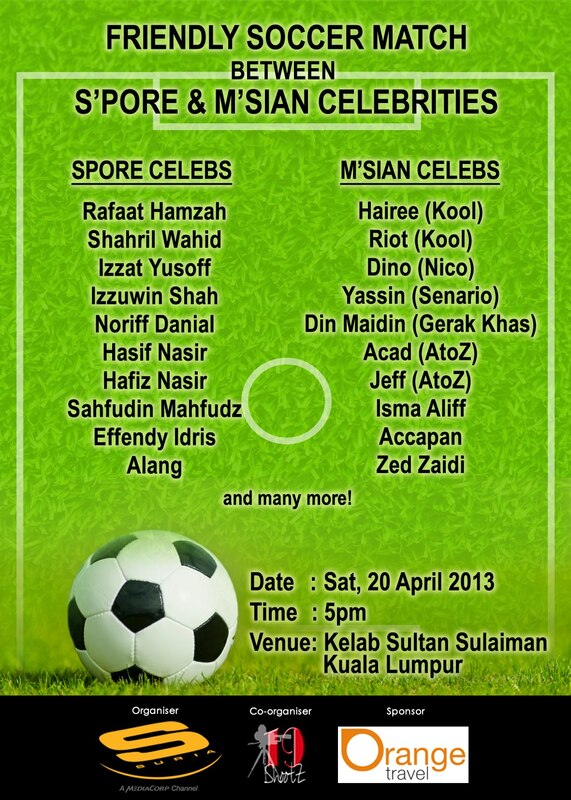 It was initially advertised that some players from the opposing team were supposed to play, but the only ones I knew who took to the pitch were ex-members of Nico, Shades, KOOL (who are all known as the super group GX-4 by the way) and Kamal Adli. The rest were unknown to me, simply for the fact that I do not watch Malaysian dramas or shows to be kept abreast of who’s who. Acappan and Isma Aliff as well as the President of Persatuan Seniman Malaysia (you-know-who) were initially touted to play, but the former two were not seen and the latter did not change into his gear, but remained a concerned spectator by the sidelines. I was actually looking forward to meeting Isma Aliff, a legend in his own right for the number of comedy films he did back in the late 80s, as well as recording several parody songs which I remember till this day. Anyway, the match was a whitewash, played in three halves of half an hour each. I hope I don’t sound too pompous and arrogant when I used the word “whitewash”, but I cannot describe it any other way. It was too one-sided, even if our team had started the first fifteen minutes playing with a lot of jitters and making a number of basic, silly mistakes, myself included. We were tired as we only arrived in Kuala Lumpur two hours prior to the game, but the moment we scored our first goal through Razif Ariff, we began to dictate play and became more confident. Further goals by Raja Izzuwin Shah, Danial Ashriq, yours truly (yes I had a cameo playing upfront in the last ten minutes, scoring with my first touch!!!) 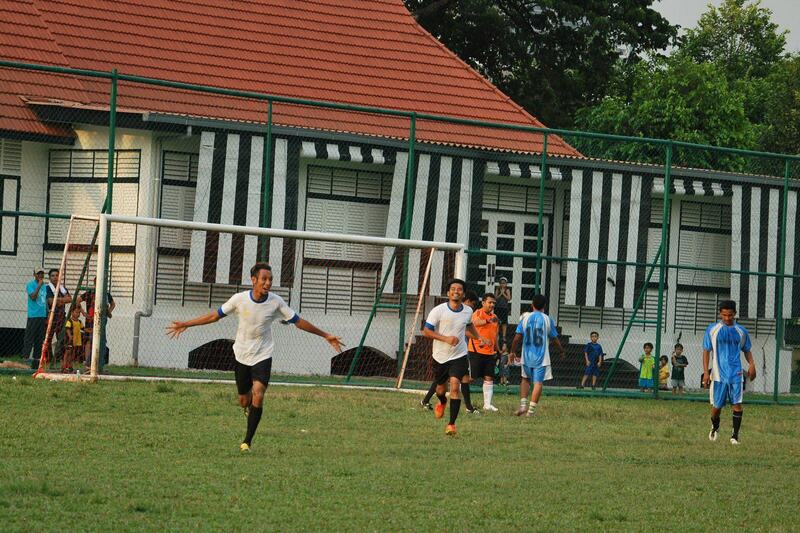 and a brace by Alang, made the scoreline a bit too flattering. You can understand why I said a 6-0 scoreline is a bit flattering. Much had been said prior to the game by well-wishers online, when they saw who was initially supposed to play in the opposing team (no prizes for guessing who). I know it is easy to get sucked into nationalistic feelings or be aggrieved by the constant sniping by you-know-who with regards to some of our artistes making a name for themselves across the Causeway. But the match was indeed a friendly match born out of goodwill and I was glad that it remained extremely cordial from the start right to the end. For that I am very happy that the players were all playing with smiles on their faces and never put ourselves in situations where things could get complicated. We were ambassadors of our country afterall and it was a great advertisement to show that we were professional, gracious and respectful towards our hosts. Let’s hope that we can return the same favour when the second leg returns in June, this time on our home soil. P.S. Special thanks go out to bro Syah Ibrahim and his team from Orange Travel for kindly sponsoring our trip to Kuala Lumpur as well as the the accomodation at Sunway Putra Hotel. The service and hospitality rendered were first class. Thank you also to Mediacorp Suria for again inviting me to join the football team and team manager Ishak Jamid for allowing me to play upfront as a striker for the last ten minutes of the game. I enjoyed the trip very much and brought home memorable moments I could replay in my head from time to time. 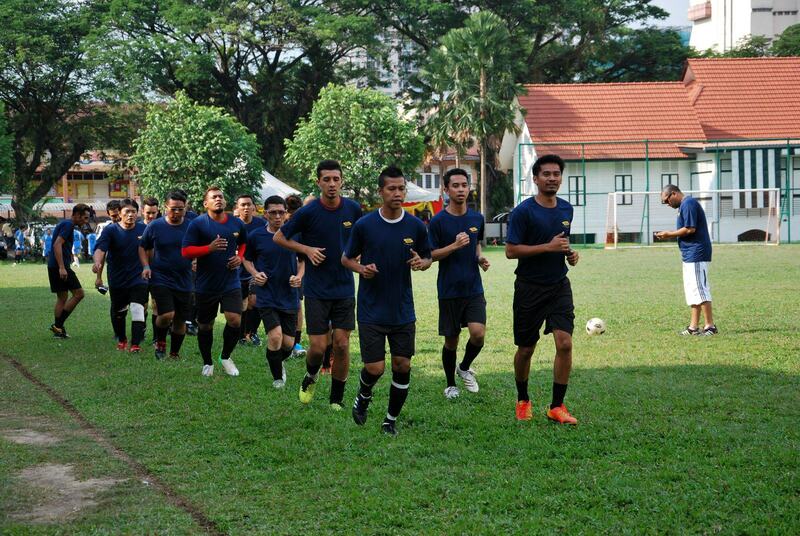 For the record, Alang was awarded the Top-Scorer trophy whereas Mohd Helmi was awarded the Man-of-the-Match award. Prizes were kindly sponsored by none other than popular radio deejay of ERA.FM and comedian, Johan (Raja Lawak). Last but not least, to the two busloads of supporters who made their way up just to support us, THANK YOU!! !